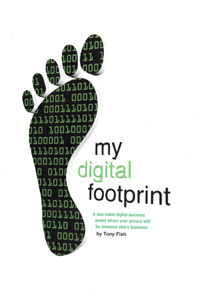 A small plug for Tony Fish’s My Digital Footprint, released in beta earlier this month. For those of you old enough to remember Nicholas Negroponte’s Being Digital , published in 1995, the publication of Tony Fish’s latest work is a milestone. Roll forward to My Digital Footprint in 2009 and reading in takes on new meaning. Although you can buy it here (or on Amazon), using money, you can also read it online for free, which allows you actively to add to (or argue against) its store of knowledge by inserting links and, if you are prepared to pay for the online tokens, by posting comments to it. (The token payment is to deter the inevitable spoiler squad who would otherwise have no disincentive to posting silly remarks, just because they can). But why should we want to do any of these things? My Digital Footprint examines the question of where the value lies in those footprints that we all leave behind as we use a digital network of one sort or another. That footprint is a valuable record of “where we have been [online], for how long, how often and the inter-relationships.” That last part is deliberately left hanging: inter-relationships between whom, or what? The question of who “owns” my digital footprint (and yours) is explored in a series of thought-provoking chapters, full of insights into who is (or could be) deriving value from them and how. The many lucid practical examples in this 2.0 book will be of interest to investors and privacy thinkers alike, to anyone, in fact, interested in new perspectives bringing the value chain in “personal (and other) data” in the abstract to life. One other footprint is worth mentioning: your carbon one. If you prefer a more traditional read, buy My Digital Footprint (see above) and don’t try to print the free online version page by page (fortunately made difficult to do by the publishers)! Tony will no doubt tell us if we can get it on the Kindle or other e-book readers…..